It’s a shame that showing your love to someone can be so expensive, especially around the holidays. There are great gift ideas that you can make, yes, but people make Wish Lists of things they want purchased. 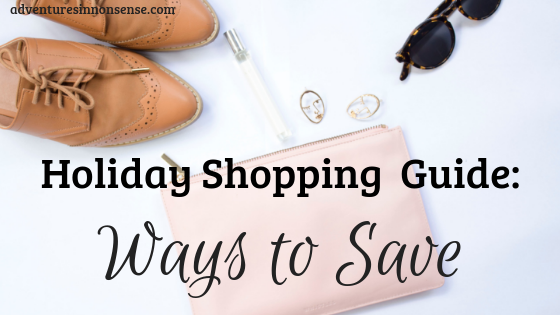 That’s why I’m sharing the ultimate Holiday Shopping Guide…to saving! Some are websites, some are shopping hacks, but they all have the opportunity to save you money. This is such an easy way to save! It’s a simple extension in your Chrome browser. It will pop up on most websites, and you can earn cash back with one simple click. Then, it accumulates in your account and you receive a magical little check in the mail. I haven’t earned much, but it is nice to get an extra $15 every once in a while. Click here to earn $10 just for signing up and making your first purchase through the extension! 2. Create an account, add to cart, and leave. A lot of sites have “nurture campaigns” in place to help you complete your purchase. If you add something to your cart, especially on boutique-y websites, and then leave the page for a few days, there is a possibility you’ll get an email encouraging you to checkout…plus a coupon! Granted, this does involve a little bit more planning, but you could save where you weren’t expecting to! There are so many different apps out there that allow you to upload a receipt and give you cash back for items you’ve purchased. Walmart has a great “Savings Catcher” that will compare your receipt to other weekly ads and give you cash back on the difference if they find a lower price. Another great app is Checkout 51. The will give you cash back on specific products and offers. Another similar app is Ibotta, and it works really well. 4. Shop sales and use rewards dollars. A lot of stores will offer “Cash” to be used in-store at different times in the holidays. They’ll allow you to earn it a bit early, with the redemption period at the peak of holiday rush. If you use these rewards, it’s like free money to spend on your loved ones! Now, I caution you with this one. If you cannot be trusted with credit cards, don’t use them. However, if you’re like me and you use credit cards for the points or cash back, USE THEM! Then, you have bonus money after the holidays to buy the gift that was missed, or pay off the credit cards you used to purchase the gifts. Don’t go crazy this holiday. We spend so much every year, and it’s getting excessive. You’d be surprised how powerful a handwritten card or a handmade gift can be to tell someone how much you mean to them. Note: This post contains affiliate and referral links, so I may receive a small commission from sales or signups generated. Title photo by S O C I A L . C U T on Unsplash.